'Hollywood Reporter' Rebrands 'Style' Vertical, Sponsored By Tiffany & Co. The Hollywood Reporter has rebranded its 5-year-old style vertical, Pret-a-Reporter, to Hollywood Reporter Style, in a relaunch sponsored by high-end jewelry company Tiffany & Co. The new style vertical will expand to include more lifestyle coverage, including real estate, travel, events, fine dining, home design and automobiles. The coverage online will now look more like theStyle section in THR's weekly print magazine. Style and fashion news director Booth Moore will oversee a weekly THR Style newsletter, with a podcast expected to launch early next year. “Our readers obsess over cars and restaurants as much as they do their next films, so I couldn’t be more excited to deliver these stories with Booth’s definitive voice at the helm,” stated Matthew Belloni, editorial director, The Hollywood Reporter. 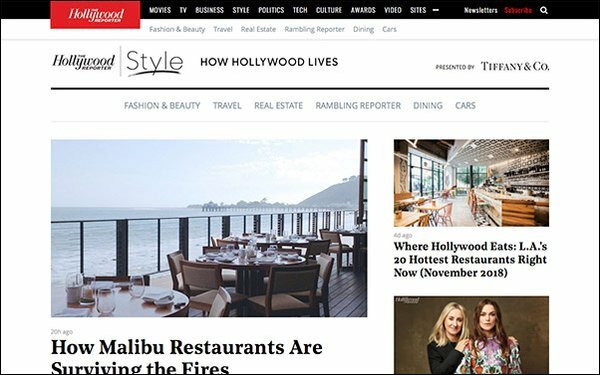 With the tagline “How Hollywood Lives,” Hollywood Reporter Style will build on the publisher’s access to talent, fashion influencers, wardrobe designers and studio executives. Just a few weeks ago, New York Post Digital Network dedicated a new vertical to celebrity fashion and beauty coverage, called Page Six Style, to focus on Hollywood trends. In September, THR Style debuted “Hollywood Style Clinic With Andrew Weitz,” a video series that takes viewers behind the scenes as Weitz dresses executives and stars for major events. “Rambling Reporter,” a column with news, gossip, event coverage and interviews, will also live on THR Style. Tiffany & Co. is promoting its Atlas 24mm collection on The Hollywood Reporter site. Parent company The Hollywood Reporter-Billboard Media Group claims its brands reach more than 40 million monthly users.